This award-winning recipe was the talk of the town in Hilton Head, S.C., where it won the 42nd Annual National Chicken Cooking Event in 1997. I wanted a fool-proof chicken recipe for dinner tonight, because I was definitely not in a chicken breast mood. I hoped that Teresa Hanna Smith of Santa Rosa wouldn’t let me down. When she won the 1997 competition, she was already a five-year veteran of the program. I trust people who have more experience than me. This year’s recipe trends were influenced by international flavors, according to Carol Haddox, judge chairman and editor of the Chicago Tribune’s “Good Eating” section. The recipes included flavors usually associated with Thai, Greek, Moroccan, Mexican, Indian, Tuscan and Italian dishes. The creative blends of ethnic ingredients resulted in some tasty poultry dishes. I’m not sure if her observations would still be considered trends at this point, more than ten years later, because I think many of those ideas still drive new recipes today. Chattanooga Free Press. April 16, 1997, Gwen Swiger, E1. Place chicken in shallow glass dish; rub all sides with garlic pepper seasoning. Pour orange and lime juices over chicken; drizzle with olive oil. Crush oregano with fingers and sprinkle over chicken. Cover and refrigerate 30 minutes, turning once. Remove chicken from marinade and place in large nonstick fry pan over medium heat. Saute, turning, about 12 minutes or until lightly browned and fork can be inserted in chicken with ease. Serve topped with Peach-Avocado salsa; garnish with lime slices. In medium bowl, mix together 1 fresh peach, peeled, pitted and diced; 1 small avocado, peeled, pitted and diced; 1 tomato, peeled seeded and diced; 1 1/2 cup diced jicama; 3 tablespoons chopped red onion and 2 tablespoons chopped fresh cilantro. In small bowl, whisk together 1 1/2 teaspoon crushed red pepper flakes, 3 tablespoons fresh lime juice and 2 teaspoons olive oil; pour into peach-avocado mixture, stirring gently. • The chicken is ridiculously moist. Deliciously, ridiculously moist. • Peaches are nowhere close to being in season in mid-January, so we debated for a while whether we should use canned peaches, nectarines, or mangoes instead. We went with the mangoes, and we were pleased with the results. • If you’ve never peeled jicama before, here’s how. 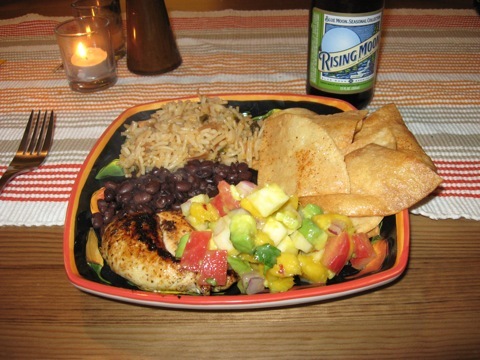 • The chicken is buried beneath the salsa in the picture. The tortillas were fried soft corn tortillas. The beans were Top Foods store brand, and the rice was Rice-A-Roni Spanish Rice. The meal was delicious overall, but I could have done without the rice. • If you would like to enter the National Chicken Cooking Contest, you have until August 31 to submit your application. 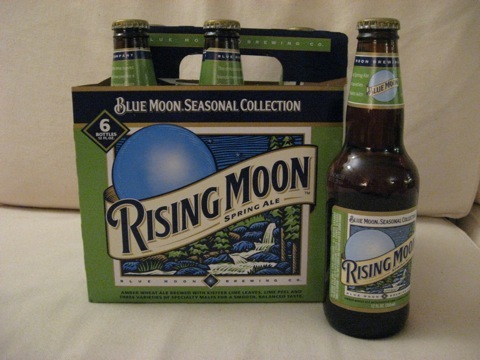 Finally, we chose to accompany our meal with Rising Moon, the spring ale from Blue Moon. Toby and I are both familiar with Harvest Moon, Honey Moon, and Full Moon (Blue Moon’s other tasty seasonal ales), but we’d never heard of Rising Moon. Regardless, it’s tasty. Not as delicious as Harvest Moon, but nice nonetheless. Because this is a recipe introduced to the world through a food competition, I figured I should mention that I just ordered an interesting-sounding book called Cook-Off: Recipe Fever in America. I’ll let you know how it is once it arrives. That looks really tasty, and it’s also gluten free. Amy likes to cook chicken so maybe we will try making this together sometime. It was lovely, although I believe Toby said it took longer to make than he originally anticipated.